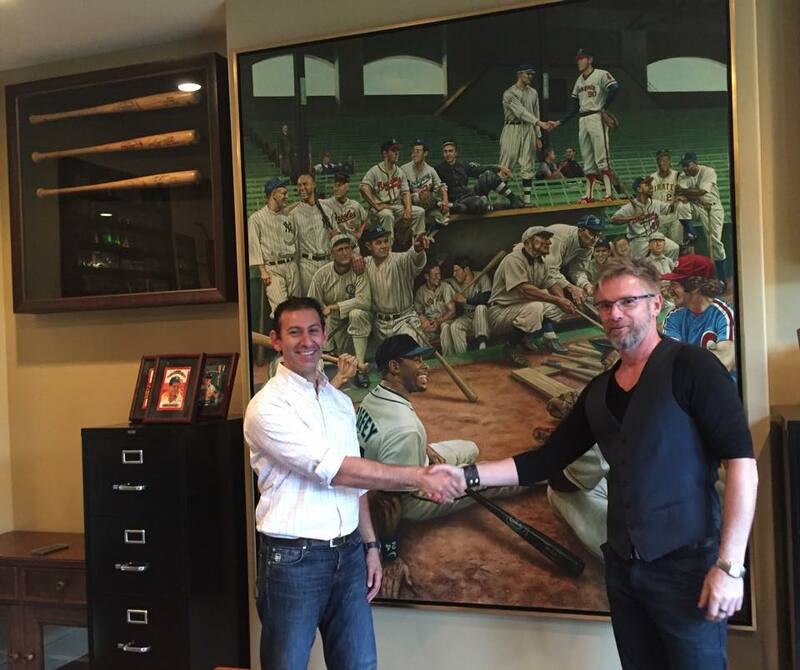 Earlier this year, sports artist Jamie Cooper wrapped up his most recent piece of MLB artwork for a private collector in California. 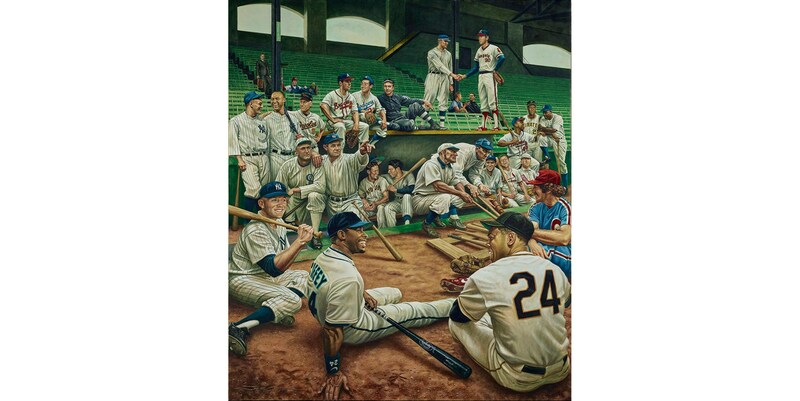 Its a masterpiece that collector will enjoy for many years to come. I’m happy to announce that prints of this piece are now available. Just like his Phillies and Yankees Dream Scenes, there was quite the demand for prints to be made of this one as well. On his website, be sure to read the description Jamie Cooper has written about it. He points out a lot of things you may not recognize at first. Mike Schmidt continues to stand out the most to me thanks to his powder blue uniform. 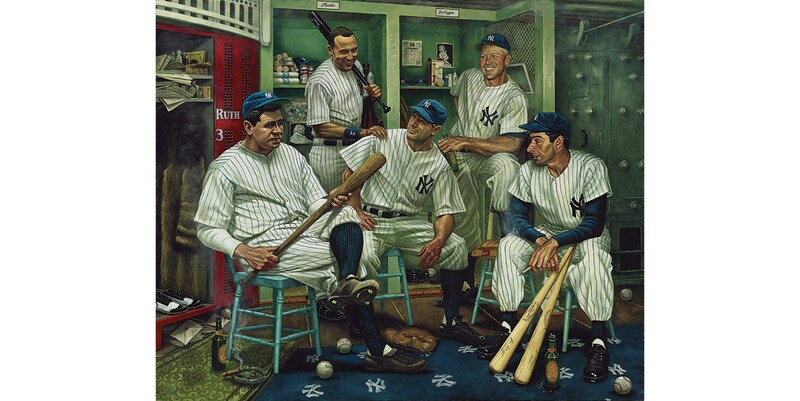 Pete Rose found his way into this piece too. You’ll find him sitting in the stands disguised as a janitor. Jamie Cooper’s artwork is truly unique. Prints based on his work make excellent gifts. Every time you look at one of them, you’ll see something new. Jamie Cooper recently showed off a portion of his latest masterpiece. 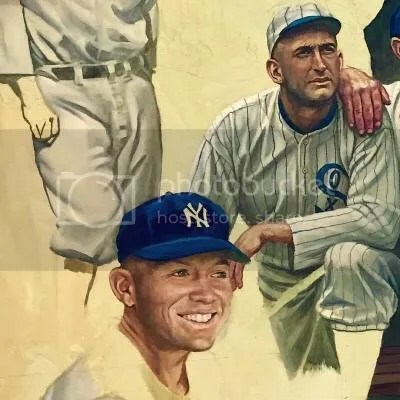 The artist behind the Phillies and Yankees Dream Scenes has been working on a painting for a private collector in the United States. This piece takes place in 1933 at Comiskey Park, which is the site of the very first All-Star Game. 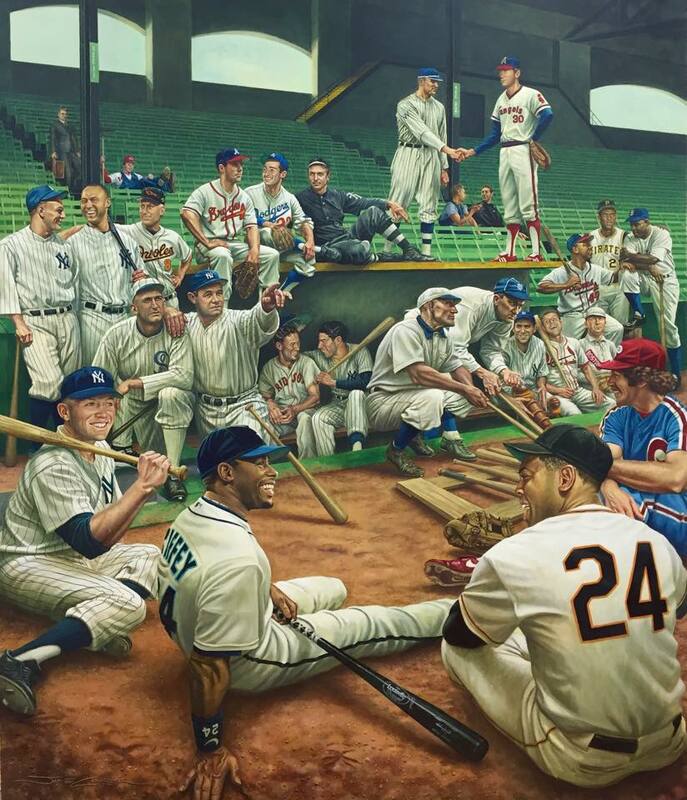 Over twenty of this private collector’s favorite baseball players will be featured in this painting. 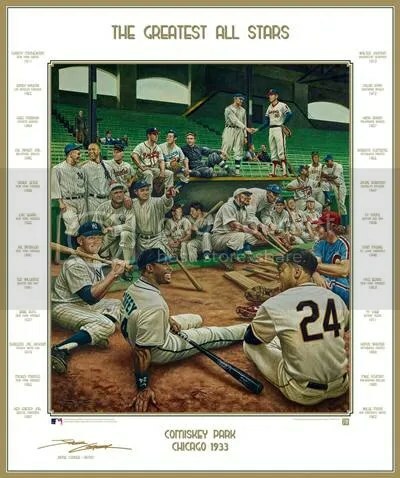 Players include Mickey Mantle, “Shoeless” Joe Jackson, Babe Ruth, Willie Mays, Jackie Robinson, Sandy Koufax, and Hank Aaron. I haven’t heard yet whether or not prints will be made available. When the painting is complete, I’ll be sure to share a picture. Outside of his U.S. projects, Jamie Cooper has been quite busy. He recently did a series of caricatures which were used for an Australian Football League card product. The caricatures were printed in 3D, and fall 1:60 packs. I would highly suggest U.S. card companies to give his work a look. 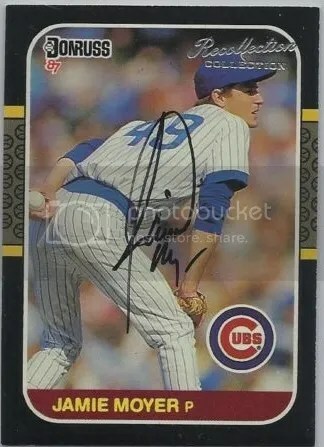 I believe he could make some interesting looking stuff for American sports cards. Next on his plate is a Dream Scene for the Spanish soccer club Atlético Madrid. You can now purchase prints directly from Jamie Cooper’s shop. His prints make great gifts. Go buy something!!! 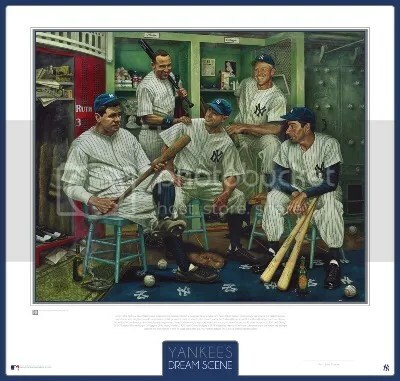 This would make an excellent gift for that ultimate Yankees fan!!! Legendary Auctions sold the original Yankees Dream Scene in August, 2013 for over $20,000.00 during the National Sports Collectors Convention. Jamie Cooper’s work is incredibly well done, and you can spend hours analyzing all the little details he puts into his work. He really does his research. Phillies fans know his work from the Phillies Dream Scene that is now hanging in the “Diamond Club” at Citizens Bank Park. 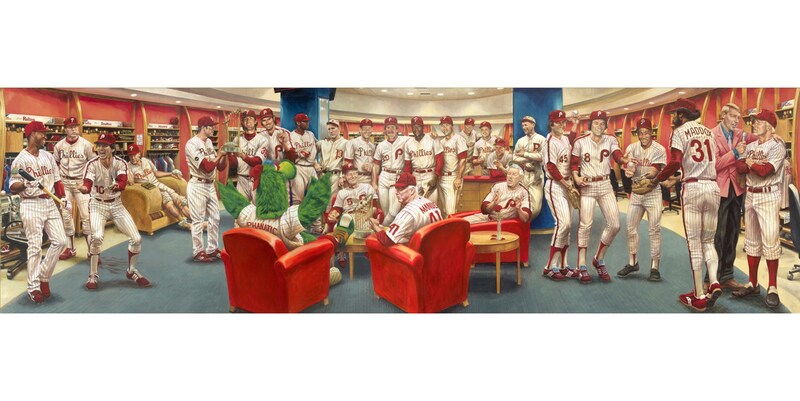 Lithographs for the Phillies Dream Scene are also available.